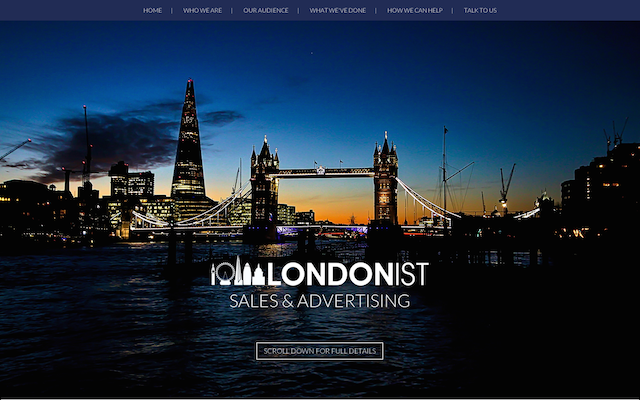 We have launched a new, commercial website to show advertisers how we can help promote their London wares to our readers. This online media kit includes key stats about our audience and examples of work we’ve done with customers such as London Transport Museum, SEA LIFE London Aquarium, National Theatre, Olympia London and Kew Gardens. It lists out available campaign elements, including sponsored articles on our website, social media posts and newsletter inclusions as well as bespoke video, podcast sponsorship, live events and display ads. Londonist relies on income from advertising and sponsored content to keep bringing you the best, quirkiest and most interesting things about London, seven days a week. We work hard to develop and deliver quality paid-for campaigns of genuine interest to you, our readers. And we know that many of you have jobs in dynamic organisations that might consider Londonist a good place to invest some marketing or advertising budget — so please feel free to recommend us to your colleagues. We’re keen to talk to any of the capital’s cultural institutions, event promoters, venues, businesses and brands that want to catch the attention of our intelligent, engaged, exceedingly attractive London audience. Visit www.londonistltd.com for more information. Thank you!